Home » A-Z Plant Index » Vegetable Garden » Rhubarb Plants and Varieties. Rhubarb Plants begin to grow at the end of the cooler months when cold temperatures have activated the new buds and crowns are usually available for sale online from July onwards. Some rhubarb produces green stems, and other varieties produce the sought after red stems. And no you can’t make the green varieties turn red. Grown from crowns, or corns Rhubarb dies back after the warmer months and is drought tolerant. If you want to grow Rhubarb it is started off from crowns. These are sold online and the crown you receive should be firm. When you look at the crown you will see the growth tips and these need to pointed upwards when planting. Rhubarb crowns are planted with the top of the crown just at surface level. This helps prevent the crown from rotting in wet winters. You need to prepare the soil well by weeding, digging lots of well rotted compost and some aged cow manure. A position in full sun is best, light afternoon shade in hotter climates may be beneficial. Did the hole deep enough to allow for the depth of the crown , and to around 24 inches around. This will allow room for good root growth. Back fill around with the compost rich soil. You can grow Rhubarb in containers, however the root system is large so you will need a large container. Rhubarb grows best in temperate climates, in cold zones it will need to be protected over winter. It is best not to harvest the stems for eating in the first year as this will slow the growth of the plant. The best time to plant new rhubarb crowns in just after the end of summer. This gives it a chance to establish a good root sytstem before winter. Rhubarb is a hardy plant and growing it is not difficult, once established rhubarb crowns, or plants will produce crops for many years. In summer it is important to provide adequate water, a lack of moisture can quickly cause the Rhubarb to wilt and collapse. The seasons for picking rhubarb in Australia are spring and summer, this is generally when the stems are at their best and have not become to old. You can pick stems at other times depending a little on the climate. Growing conditions to look for are a humus rich moist, but well drained soil in a sunny position. Established clumps of rhubarb plants will benefit from being divided every 3-4 years. Fertilize with a seaweed fertilizer or dynamic lifter. Every second week water with a liquid seaweed solution. Watch out for flower spikes, this is an indication that the clump is overcrowded, or it is stressed from lack of water. Divide Rhubarb and transplant in late winter to spring. Select the healthiest looking crowns from the clump, gently tease and pull apart retaining as much of the root system as possible and replant in a new position with some well rotted cow manure an compost dug into the soil. 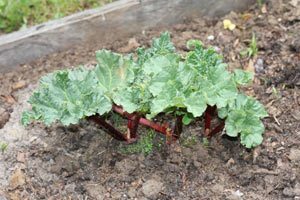 Rhubarb Plants are best divided in late winter, July to August, larger established crowns can easily be separated into a number of root or crown sections using a sharp knife. Simply dig up the whole crown, look for sections with 2 or 3 good buds or eyes and at least 1 leaf, and use the knife to divide. Replant in a freshly prepared bed with lots of compost and aged manure dug in. Plant with the growing eye just above ground level. Rhubarb crowns need dividing every 3 – 5 years to remain healthy and productive. Water in well with a seaweed fertilizer and keep the area weed free. Popular types in Australia include ‘Wandin Red’, ‘Silvan Giant’, ‘Ever’ and the green stemmed ‘Queen Victoria. Giant Victoria rhubarb is often grown from seed and is a prolific producer with large stems more often used for commercial production of jams and preserves. The stems are usually not as red as many varieties used for the home garden. It does have the advantage of being able to grow in part shade, however is better in full sun, winter dormant. Remember that Rhubarb leaves and roots are poisonous, only the stem are edible. Those tall stalks that rise from the centre of the plant, white, green and red are rhubarb flowers, and if you see them, simply cut them off as low down as possible. As with all plants, when they try to flower and set seed they take energy from the plant and put it into the flower. This is not what you want with rhubarb, you want new stems so that you can pick and cook them. And believe us, rhubarb flowers are not that pretty anyway. As for collecting the seeds and using them to grow more rhubarb, remember that you are growing a cutivar, and from the seed you will not get the same plant.